In Brhat Parashara Hora Shastra 3rd chapter (Santhanam Ed. ), Maharishi Parashara enumerates about 5 Aprakash Grahas, 5 Upagrahas and Pranapada. These affect the life of the native at a very subtle level, since these Upagrahas do not have body of their own and behave like shadowy planets. The effects can be visible not only in the dasa of the planets associating with them, but also during the whole life of the native, which can be modified by the influences of the dasas etc. The importance of these bodies can be seen from the place where these are described. They are described in the same chapter where the Grahas (planets) are described. Thus Maharishi wanted us to check the influences of these planets as well in addition to the visible planets to delineate horoscope in details. 61-64. Aprakash Grahas. Add 4 Rāśis 13 degrees and 20 minutes of arc to Sūrya’s longitude at a given moment to get the exact position of the all inauspicious Dhoom. Reduce Dhoom from 12 Rāśis to arrive at Vyatipat. Vyatipat is also inauspicious. Add six Rāśis to Vyatipat to know the position of Parivesh. He is extremely inauspicious. Deduct Parivesh from 12 Rāśis to arrive at the position of Chap (Indra Dhanus), who is also inauspicious. Add 16 degrees 40 minutes to Chap, which will give Ketu (UpaKetu), who is a malefic. By adding a Rāśi to UpaKetu, you get the original longitude of Sūrya. These are the Grahas, devoid of splendour, which are malefics by nature and cause affliction. 65. Effects of Sub-Grahas. If one of these afflicts Sūrya, the native’s dynasty will decline, while Candr and Lagn, respectively, associated with one of these, will destroy the longevity and wisdom. So declared Lord Brahma, the Lotus-Born. 66-69. Calculations of Gulika and other upagrahas: The portions of Sūrya etc. up to Śani denote the periods of Gulik and others. Divide the day duration (of any week day) into eight equal parts. The eighth portion is Lord-less. The seven portions are distributed to the seven Grahas commencing from the Lord of the week day, while 8th portion governed by Gulika. Similarly make the night duration into eight equal parts and distribute these, commencing from the Lord of the 5th. Here again, the eighth portion is Lord-less and represent the portion of Gulika. Sūrya’s portion is Kaal, Mangal’s portion is Mrityu, Guru’s portion is Yamaghantak and Budh’s portion is Ardhaprahar. These durations differently apply to different places (commensurate with variable day and night durations). 70. Gulika’s Position. The degree, ascending at the time of start of Gulika’s portion (as above), will be the longitude of Gulika at a given place. Based on this longitude only, Gulika’s effects for a particular nativity is estimated. 71-74. Calculation of Pranapad: Convert the given time into Vighatis and divide the same by 15. The resultant Rāśi, degrees etc. be added to Sūrya, if he is in a Movable Rāśi, which will yield Pranapad. If Sūrya is in a Fixed Rāśi, add 240 degrees additionally and, if in a Dual Rāśi, add 120 degrees in furtherance to get Pranapad. The birth will be auspicious, if Pranapad falls in the 2nd, 5th, 9th, 4th, 10th, or 11th from the natal Lagn. In other Bhavas Pranapad indicates an inauspicious birth. The five Aprakash Grahas namely Dhuma, Vyatipata, Parivesh, Indrachapa and Upaketu (Sikhi) are calculated based on the longitude of the Sun at time of birth or Prasna. Each day and night can be divided into 8 equal parts called yamardha. 7 of the 8 Yamardhas are governed by the weekday lords in the order of the weekdays from Sun to Saturn whereas the part after Saturn is unlorded. The Yamardhas for the day and night are to be found out separately based on the dinamana (duration of the day) and ratrimana (duration of night). Step I: If the birth is before sunset, then find the duration of the day and if the birth is after sunset, then find the duration of the night. Step II: Divide the day duration or night duration with 8 to get the 8 yamas of the day or night. The Yama starting at Sunrise is lorded by the weekday lord, whereas the Yama starting at Sunset is lorded by the 5th planet from the weekday lord in the weekday order. Thus on Sunday, the first Yama at Sunrise is lorded by Sun, whereas the first Yama at Sunset is lorded by Jupiter, who is the 5th weekday lord counted from Sun. The subsequent yamas are governed by the subsequent weekday lord. This means that on Sunday, Mandi shall rise after the completion of 26th part, i.e. in the 27th part, similarly on Monday, Mandi rises in the 23rd part and on Saturday it rises at the commencement of the 3rd part. Thus Mandi rises in the middle portion of Saturn’s part each day. This can be extended to other Upagrahas of other planets such as Kala for Sun, Mrtyu for Mars, Ardha-prahara for Mercury and Yamaghantaka for Jupiter. Step 2: Find the time of rise using the following formula: Duration of day or night * Upagraha rising value / 32. Step 3: Find the ascendant rising at the time arrived. For night birth consider Sunset instead of Sunrise and Night duration, instead of day duration. Since Gulika rises at the end of Saturn’s portion or beginning of un-lorded portion, following formula can be used for finding it. Step 2: Find the time of rise using the following formula: Duration of day or night * Upagraha rising value / 8. The yamardhas of the day shall rise in the order of Mars -> Merc -> Jup -> Ven -> Sat -> Un-lorded yamardha (Gulika’s yamardha) -> Sun -> Moon. The yama# of the unlorded part is 6th yama. The rising time of the 6th yama shall be 5* yama duration + Sunrise = 5* 1.8673 + 4.2388 = 13.5753 = 13:34:31. This time is called Gulikodaya (Gulika+Udaya) Kala or the rising time of Gulika. The Lagna rising at that time is 100 35’ 28” Virgo. 2. Gulika = Ascendant rising at Gulikodaya Kala. Planets vs. Aprakash Grahas and Upagrahas. He says that the Upagrahas are lorded by Sun to Ketu and they bestow painful results to the native. The lordship is Kala, Paridhi, Dhuma, Ardhaprahara, Yamaghantaka, Kodanda, Mandi, Pata, Upaketu respectively assigned to Sun to Ketu in the weekday order. Rearranging the lordship for aprakash grahas and Upagrahas, we arrive at the following list. If the Upagrahas are placed in dignity, their evil effects are reduced. Pranapada traverses a sign in 15 Vighatis. We know that the Lagna approximately traverses a sign with a rate of 5 ghati or 300 vighati. This shows that the Pranapada Lagna moves at the speed 20 times faster than the Lagna. Step I: Find the Ista Ghati . Multiply this with 60 to find the Vighati elapsed after Sunrise. Alternatively this can be found by multiplying the hrs elapsed after sunrise to birth with 150, to get the Vighati. Step II: The Ista Kala in Vighati is divided by 15 and resultant is to be converted in Rashis (Signs), Degrees, minutes etc. and be added to the longitude of the Sun at the time of Sunrise. This shows that how much sings the Pranapada Lagna has traversed from Sunrise @ 15 Vighatis per sign. Step III: The Pranapada Lagna is always counted from the Movable sign in trine to Sun. Thus, if Sun is in movable sign, the final longitude will straight away yield Pranapada; if the Sun is in dual sign; add 120 Degree and if in fixed Sign add 240 degree additionally to get Pranapada. Since the Pranapada indicates the life energy, it is always counted from a movable sign, from Sun, the giver of Life. Step III: Add Sun’s Degree with the degrees arrived at step II. This comes out to be 17d 20’. The No. of signs to be counted from the Movable sign in trine to Sun in Leo, should indicate the Pranapada Lagna. The movable sign in trine to Sun is Aries and counting 6 signs from Aries it comes to Libra. Thus the Pranapada becomes Li 17d 20’. ->    Come out of any difficult situation. ->    Imprisonment for cheating the govt. ->    Lose property to the govt. ->    Leaves his spouse and children. ->    Endowed with wealth & property. ->    Advisory jobs in Govt. ->    Earns due to courage & bravery such as thieves, bandits, police officials, army men etc. ->    Run away from material pursuits such as house, property, vehicles etc. 1. If any planet is conjoined with or aspected by (7th aspect) or disposits Gulika, during their dasa or Antar dasa or during transit of such planets on Gulika, troubles will be seen. 2. When Yamaghantaka’s dispositor conjoins any planet, then during the Dasa, Antar of such planet auspicious results like marriage, new house warming ceremony, birth of a child, Deva Pratishta etc. happen. 3. When Ardhaprahara’s dispositor conjoins any planet, then during their Dasa and Antar, events like court case, compromising of a case, agreement, signing of new business etc. may take place. 4. Normally during the Kala’s dispositor’s dasa- antar or the dasa- antar of the planet conjoining the dispositor only bad events may take place. 5. Normally when the Upagrahas conjoins any planet, during the dasa and antar of the said planet, Upagrahas will give their full results. During the dasa of lords and dispositors of Upagrahas, they will give 50 % of results. Any planet that is opposite to an Upagraha, during its dasa and antar 75% results can be seen. 6. During the transit of Shani on Gulika, the person loses his wealth, honor and fame. Following case studies shows the effect of the Aprakash grahas and Upagrahas in shaping the life of the native. Check if there are planets in the house occupied by the Upagrahas, if, yes, then their results shall dominate, otherwise the results of the Upagrahas shall dominate. Lose house and property    He went abroad away from his family and at many times when he traveled; he was away from his family. In a positive sense “engaged in evil activities” could be treated as his rebellion against the ruling govt. at that time. Run away from material pursuits such as house, property, vehicles etc. In career, superiors will doubt the person and he might be punished for something which he is not responsible. Imprisonment for cheating the govt. Lose property to the govt. Come out of any difficult situation. Leaves his spouse and children. 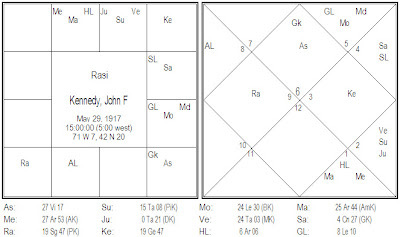 very informative and something out of the league.Tried applying in my own chart.Fits well.DADA,keep up the good work.Looking forward to more of your nakshatra posts. I have also tried them. But they are a confusing lot. The best thing is to track...to whom these points relates to... whether to self...or other persons...or how that person or situation is related to the native is... most important. Unless you are able to find out... they means nothing to you !